Congratulations have come in from Islamic leaders including Iranian President Hassan Rouhani. Russian President Vladimir Putin talked of Mr Erdogan's "great political authority and mass support". Turkey was entering a dangerous period of one-man rule, he added. There were another four candidates on the presidential ballot, all of whom fell below 10% of the vote. "We are living through a fascist regime", the opposition MP Selin Sayek Boke told the BBC. "But fascist regimes don't usually win elections with 53%, they win with 90%. So this shows that progressive values are still here and can rise up." 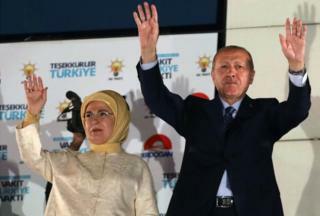 He'll now hope to lead the country at least until 2023, a hundred years since Ataturk's creation. And a dejected opposition will have to pick itself up and wonder again if, and how, he can be beaten. In a development that will please Kurdish voters, the pro-Kurdish HDP exceeded the 10% threshold needed to enter parliament. With 67 seats, it will form the chamber's second-largest opposition faction.